The most important aspect of a successful open house is a successful marketing and promotional plan. Get the word out through social media advertisements, open house fliers and door hangers, newspaper ads, and word of mouth. Use all media available to reach the largest audience. Put up directional signs with balloons in the neighborhood and at the front of your home – if no one can find it, not even the most convincing advertisement will save your open house. Clear surfaces and floors of toys, magazines, ornaments, etc. This is the presentation of your home to the public. Mow the lawn, clear out weeds, and remove toys or other debris from your yard. Plant flowers in your garden and trim the shrubberies. Make the outside of your home reflect your hard work and staging in the inside. Dogs, cats, and other pets should be neither seen nor heard during an open house. Taking them to the park for the day or to a friend’s house will be well worth it. If removing a pet isn’t an option, do not let them roam freely. Try to move them to a confined, less trafficked space until the open house is over. There is nothing worse than unidentified aromas in a home. No matter what the cause, it’s important to neutralize. Be mindful of factors that contribute to certain odors such as pets, old food in a refrigerator, certain foods cooked the night before, and smoking. Though you may be used to the odor, it can be quite obvious to an outsider. A simple solution is to invite a friend or relative to do a “smell test” in areas of your home. Ask them to give honest feedback so you can identify and eliminate source. Temporarily changing your lifestyle, such as smoking outside or cooking less potent foods, and hiring a cleaning service is the best way to rid your home of odors before an open house. Have a drawer that doesn’t close correctly? Have cabinets that are missing handles? Do your walls need a paint touch up? Stains on your carpet? Leaky faucet? It’s time to stop procrastinating and finally tackle these home repairs. If you’ve been avoiding the hassle, chances are buyers want to avoid them too. Remove all pictures and albums of your family on the day of your open house. You do not want buyers imagining your family living at your home; you want them to envision their families living in their new home. Don’t let the excitement of a busy open house distract you from your own safety. Lock up small, personal items such as jewelry and expensive electronic devices. Be mindful of bills you may have laying on the counter or personal checks with account numbers and credit card receipts. All spare keys and garage door openers should be out of sight and locked up. Be mindful of certain medications: do not leave them in bathroom medicine cabinets. Doing small things such as setting your dining room table will go a long way. Try to make the environment look natural, like you’re having close friends over for Sunday brunch. Air out your home, turn on all lights, and open all of your curtains. Buyers love walking in to a bright and airy space. Add fresh flowers or fresh baked cookies as a finishing touch. Need more help? Friendly professional service is just a call away! Contact me for help getting your home sold. This year- 2016- could be your last chance to list your home in the booming seller’s market, so if you’ve been toying with the idea of selling, now is the time! The projections for this year largely remain in favor to do so. In 2016 sellers can look forward to increasing home prices, low inventory, and intense competition. March is the perfect time to get everything in order so you’re ready to enter the market and put that for sale sign on the front of your yard. Home buying season begins in April and reaches its peak in June. But what makes the current market so suitably tailored to sellers this year? The answer is economics 101: supply and demand. Simply put, the amount of interested buyers shopping around the housing market far exceeds the inventory of available homes. According to the National Realtors Association, in January 2016 an MLS-listed home was on the market for an average of just 64 days, and they found an 11% increase of houses sold in 2015 vs. 2016 on a seasonally-adjusted annualized basis report. This is excellent news for sellers, because they can expect competitive bidding wars on their homes. The bidding will drive up the pricing of the property, and the seller will come out on top. So, if you wait to sell your home until the warmer months, you will miss out on competitive buyers. What is causing the increase of demand in 2016? Interests rates are expected to go up. The Federal Reserve has hinted the rates are going to increase sooner rather than later. This is causes passive buyers to take action and make fast decisions in the market to secure low mortgage rates. Over the past few years we’ve also seen rent prices skyrocketing. The average price to rent an apartment or home has risen 15% in 70 metro areas across the United States. First time homebuyers are entering the market to avoid the rising rent costs, secure a stabilized mortgage payment, and to invest in properties for their future. Finally, tax benefits still work in favor of the seller. Selling a home can secure a large tax break on your 2017 filings. 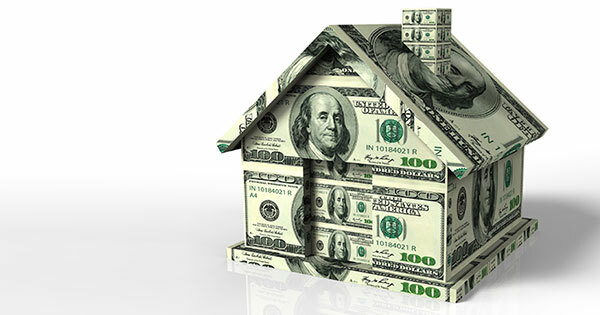 You can exclude capital gains from the sale of a personal residence on your taxes. Single tax payers can exclude up to $250K, and joint filers can exclude up to $500K. Though be mindful of meeting the requirements before your finale decision to sell is based on the exclusion: you must have lived in the home for 24 consecutive months within the past 5 years, and you cannot have claimed a home-sale exclusion of your returns in the past two years. Siting your garden. 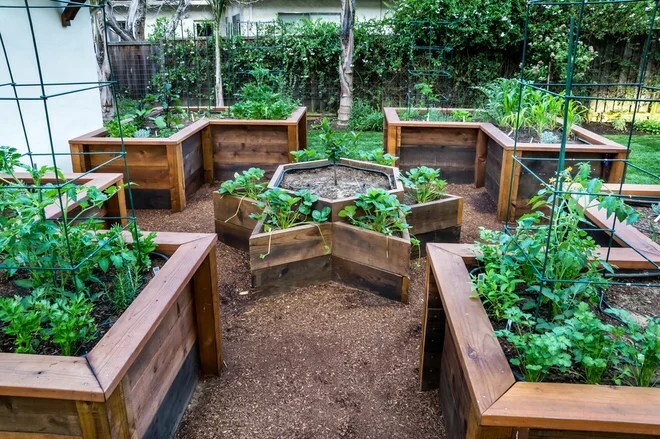 If you’re building new raised beds or using planter boxes that can be moved, make sure that your vegetable garden is in the right place. Specifically, make sure that it gets plenty of light. What direction does your garden face? In the Northern Hemisphere, south-facing yards and balconies get the most light, while north-facing gardens will almost always be shaded by comparison. West-facing gardens will get intense afternoon light, which can in some cases be hard on tender greens like lettuce. Gardens with mostly eastern exposure will get soft morning light, which may not necessarily be bright enough to grow sun lovers like tomatoes. Take a look, too, for buildings, trees and other structures that could block light by creating shadows. If you live in a sunny climate, getting enough light may not be a big deal. In fact, some afternoon shade can be a big advantage in places with hot summers. If you’re in a rainier environment, such as the Pacific Northwest, getting adequate light can be a challenge. You may want to locate your vegetable garden in the sunniest spot, even if that’s your front yard. If you can’t move your garden, work with what you have and choose your crops accordingly. Most salad greens, like spinach and lettuce, will grow happily in partial shade but can really suffer under hot sun. Good soil can help compensate for a less than perfectly located garden. Slope can also affect how you site your garden. Is your space mostly flat or does it have a variety of heights? In dry climates, take advantage of slope by planting in a low-lying area, which can better retain water. In a wet or shaded environment, planting on a south-facing slope, or in a raised area, can help increase drainage and sun exposure. 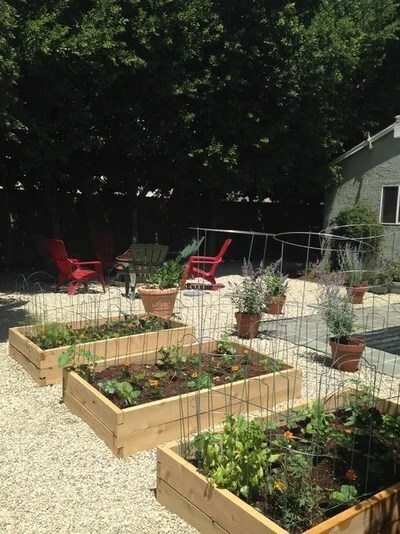 Keep in mind that raised beds should always be level. Determining your goals and capacity. Just because you have an entire backyard at your disposal doesn’t mean you should plant your whole yard right away. Gardening can be a lot of work, and you don’t want to get discouraged and abandon the whole project. If you’re new to gardening, hold back and start small. If things go well, you can always expand next year. Take your lifestyle into consideration. If you like to travel, have a busy schedule without much free time or are planning home renovations in the next year, consider building a smaller, less permanent container garden. An irrigation system with timers is a worthwhile investment if you don’t think you’ll be able to water your garden regularly. 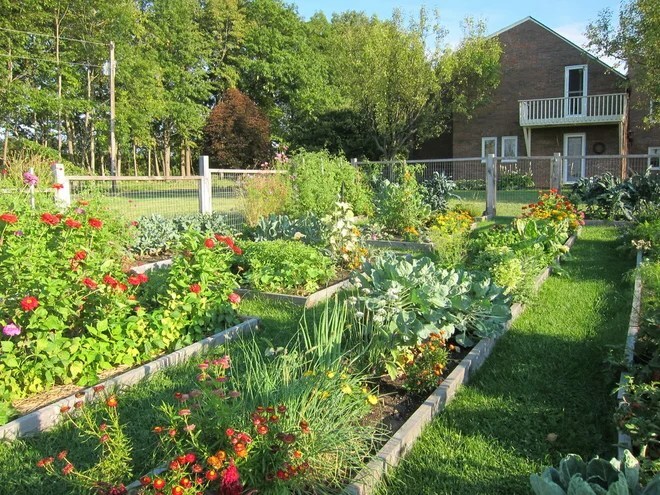 Determine a goal for your garden and use it as a guiding principle. Your goal may be to have lots of fresh herbs available right outside your kitchen window, to provide a full plate of produce for your family or to teach your children where food comes from. Each of these goals will result in a different garden plan. Getting practical. Ask yourself what items need to be built, purchased or designed for your space and make the appropriate arrangements to get the work done. If you’re starting a new garden or redesigning an existing one, your to-do list will likely involve building raised beds or obtaining containers, testing your existing soil for contaminants such as heavy metals and ordering a delivery of high-quality topsoil or potting mix. Even if you’ve been growing in the same space year after year, take a moment to determine what maintenance is needed at this time. There’s a good chance that you’ll need to add compost (either homemade or purchased from a reputable supplier) to refresh tired soil and repair damaged structures. Ask yourself what you can add that will take your garden to the next level. Trellises, row covers, cold frames, greenhouses and irrigation systems can make a huge difference when it comes to how much food you can grow. Choosing what to plant. Once you have a sense of your goals and capacity, it’s time to choose your plants. Need help deciding? Here are eight surefire vegetables and herbsthat work well for nearly any garden, even if you’re a beginner. Deciding where your plants are going, and when they’ll be planted, is where the true artistry and challenge of gardening comes in. Keep your plan simple. Allocate a space for each of your crops, taking into consideration that some plants, like salad greens, need very little room, while others, like pumpkins, can get enormous. 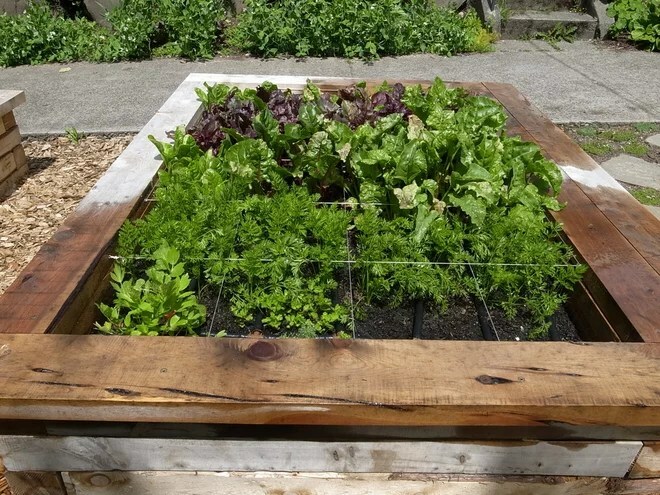 If you’re growing in raised beds, consider dividing each bed into tidy sections using string and nails, a method known as square-foot gardening. This technique is especially helpful with salad greens, which do best when planted in small amounts every week or two. Keep in mind that it’s best to avoid planting the same crop (or a close relative) in the same place year after year. Rotating crops helps prevent soil-borne plant diseases and nutrient deficiencies. It’s all too easy to get excited about a garden early in the year, only to abandon it weeks later when the work becomes overwhelming. By doing some advance planning, you’ll give your garden the best opportunity to thrive. Have you ever had a bad neighbor? Time to smile! There are many young people debating whether they should renew the lease on their apartment or sign a contract to purchase their first home. As we have said before, mortgage interest rates are still near historic lows and rents continue to go up. 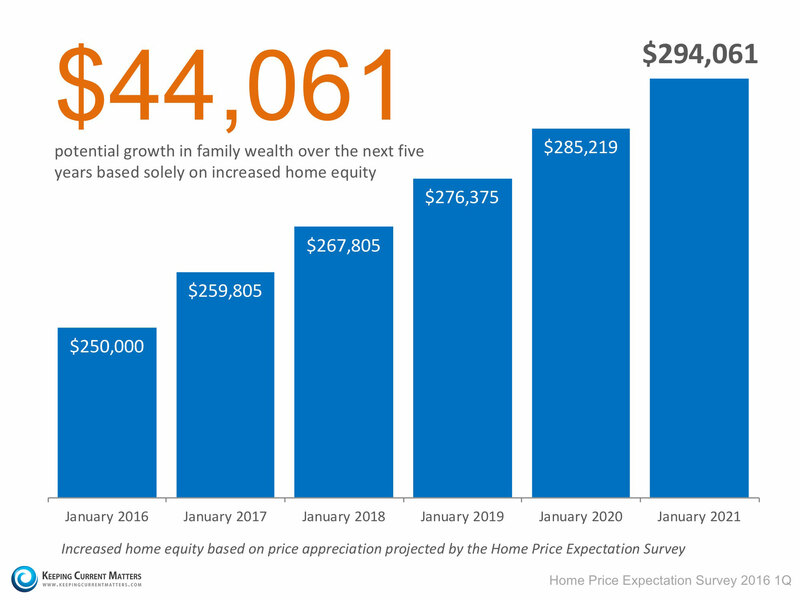 Below is an example of the home equity that would be accrued over the course of the next five years if you had purchased a home in January; based on the results of theHome Price Expectation Survey. Use your monthly housing cost to your advantage! Meet with me to go over how we can get your started building your net worth!